Now showing in full color! By the time you read this, our Mini Masterpieces Show will be up and running. Congratulations to all those who won ribbons. 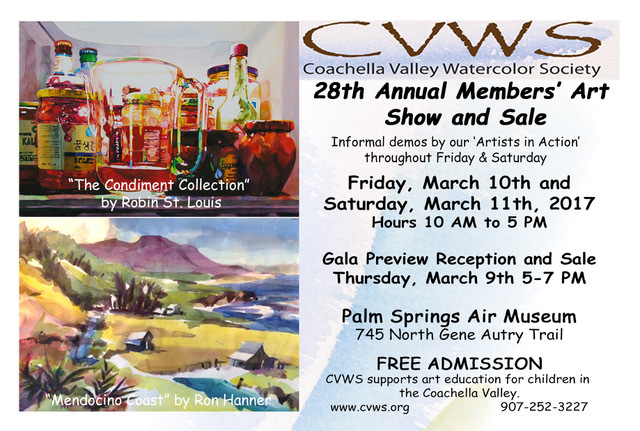 If you haven’t seen the show, do call in at the Historical Society in Palm Desert and tell your friends and neighbors. The show is open Fridays, Saturdays, Sundays and Mondays, 10am to 3pm until February 13th. Don’t forget that pick-up is on Tuesday 14th from 12-2pm. Be in it to win it! Following in a few weeks’ time is our annual show which this year will be more extensive than ever with categories for Traditional and Open Presentation as well as Plein Air paintings. Entries must be postmarked by March 2 and intake is on March 9. If you haven’t yet entered please do take part. In particular, we encourage those that haven’t entered a judged show before to give it a try, as there is a special ribbon and $50 prize for the best ‘Emerging Artist’. Full information on our website www.cvws.org. You, you and YOU! - We are also in need of more volunteers. There are many opportunities both during the set-up and take-down as well as when the show is open to the public. If you haven’t been asked yet but are available, please call Traci or Ian, or sign up at the next meeting. Lucky Draw - In addition, we need prizes suitable for our raffle Last year we raised a very important $900. Prizes in any category are needed. You can make an attractive basket or just bring an item and the committee will put a basket together for you. Please bring these to the meeting on February 13. Show them your tricks! This year we are replacing our formal demonstrations with a series of painting stations where visitors can see our members in action. If you are happy to spend an hour or so painting and chatting with our visitors about your work let us know. All very informal. Volunteers will be able to display extra work for sale. Tell the world! There will be plenty of promotional cards at the February meeting, so do take some to invite your friends and leave a few in your local coffee shop. 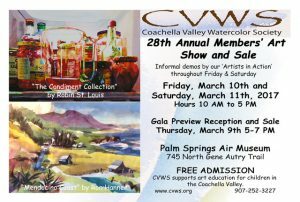 The show is at the Palm Springs Air Museum with an artist’s reception and sale 5-7pm Thursday March 9 and runs Friday and Saturday, March 10 and 11, from 10am to 5pm. The show is open to the public at all of those times.